Have you experienced the edge sharpness of a Japanese knife as opposed to the conventional European knife at 20 degree angle? If yes, then you’ll definitely know this razor-sharp edge is far superior than the traditional European knives. But this is going to change with the best 15 degree knife sharpener we’re going to share with everyone. Asian knives are sharpened at 15-degree angle. The steeper angle creates a sharper edge and therefore helps to cut food with precision and less effort than the 20-degree bevel. We know that today’s professional sharpening technology and the super sharp edge they achieved can be accomplished at home within minutes. Without guesswork, this is a perfect choice. Short on time, read the reviews and check the lowest price here. You might think the whetstone can transform the bevel angle and why need a knife sharpener. Yes, this is a feasible way if you can spend hours and a few practice sessions to do it right without ruining the knife. If you already have the experience in manual sharpening using the whetstone, it’ll greatly help as we think it’s not easy to maintain the consistent angle on both sides of the blade. But practice makes perfect. If anyone wants to master it, we’d say, go for it. Otherwise, use the tried and true sharpening machine to transform the bevel angle and within minutes a razor-sharp 15-degree edge is born. Once you’ve experienced the precision and sharpness of the transformed 15-degree bevel angle, you’ll love it. Many chefs and home cooks appreciate this sharpness and have since switched over to the Japanese style of knives for their daily cooking needs. So, if you’ve a bunch of American and European style of knives and would like to enjoy the sharpness of the 15-degree edge, get a high performance 15-degree knife sharpener to help you do the dirty job. Having a high-quality knife sharpener does have its advantageous. Asian knives tend to become dull quicker than the thicker edge of the typical European knives. So it requires to sharpen more often. A home knife sharpener thus come into the picture. 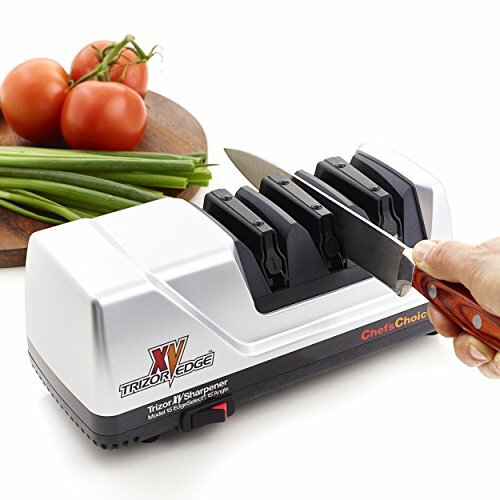 If you like to cook very often, then having a high performance knife sharpener is a great addition to your kitchen asset. When it comes to heavy-duty sharpening needs, we’d not hesitate to recommend the Chef’s Choice 15 Trizor XV EdgeSelect. It’s the best 15-degree knife sharpener in the market. What Makes Trizor XV as the Best 15-Degree Knife Sharpener? The first question: Why choose Chef’s Chocie Trizor XV? Firstly, it has been proven time and again to restore very dull knives to razor-sharp in minutes. Secondly, it can repair severely damaged knives no other sharpener in the same category can really match. Thirdly, America’s Test Kitchen had conducted a test and recommended the Trizor XV as the best electric knife sharpener for the 15-degree angle knife. Chef’s Choice has been manufacturing many types of knife sharpeners since 1985. This model is particularly good for sharpening Asian knives and to transform a knife at 20-degree to 15-degree angle edge as well. With decades of experience making manual and electric models, we know the quality from Chef’s Choice are the best in the market. 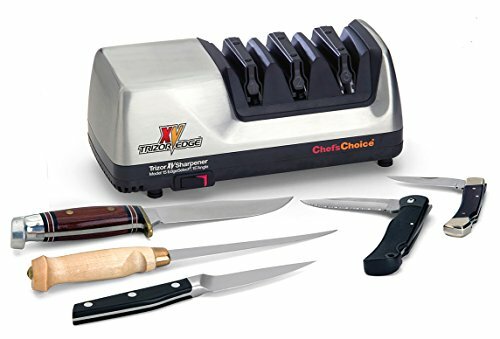 Read more on Chef’s Choice knife sharpener review to have a glimsp of the different models and features. Let’s go through the key features and specifications of the Chef’s Choice 15 Trizor XV. The Trizor XV features a 3-stage sharpener with 100% diamond abrasives to achieve superior sharpness. Most of the Chef’s Choice sharpeners are made from diamond abrasives because of its material that is able to deliver a razor-sharp edge. When a dull knife needs to reshape, use the first stage first. The first stage is used to sharpen very dull blades. The coarser diamond coated discs are used in this stage. Since it is a heavy-duty sharpener, it removes most of the metal in this stage. This stage is where the 20 to 15-degree angle conversion takes place. The second stage requires only medium coarse diamond coated discs and it gets to sharpen not very dull knives. Most of the regular honing is done in this stage once the knives have converted to a steeper edge. It also creates a second bevel on the edge of the blade to increase durability. The third stage is the final stage to strop and polishes the knife. It uses the patented flexible stropping discs to deliver a razor-sharp edge. Serrated knives are sharpened in this stage as well. The Trizor XV has a unique built-in feature known as EdgeSelect. The knife edge can be optimized for the individual cutting task. 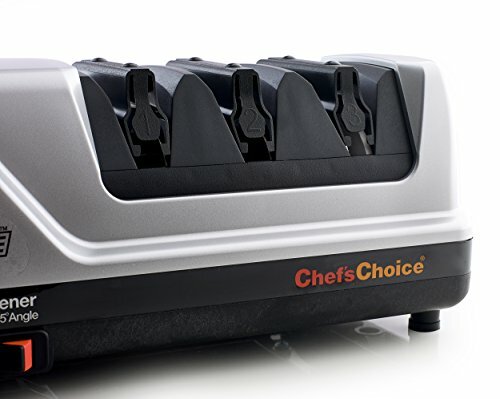 The EdgeSelect is a patented technology only from Chef’s Choice. For example, one knife can be sharpened to have a smooth and clean cut on fruits and vegetables. Another knife can be optimized to cut meats and fibrous materials by sharpening only in stage 1 and 3. Lastly, the optimum edge for cooked poultry can be easily achieved using only stage 2 and 3. Not all sharpeners have this feature, but the Trizor XV is one of them. The Chef’s Choice 15 Trizor XV is a domestic high-end sharpener and it’s famous for its built quality and sharpening results. All the expensive chef knives can be safely sharpened by this unit. You’ll see the smooth sharpness on the entire edge is comparable to the professional sharpening service. The well-designed and high-quality spring guides did a good job in controlling the blade during the sharpening process in all the stages. The mechanics of the spring guides is one of the key factors in getting a ragged-free sharp edge. Combined with the diamond abrasives and flexible stropping discs, you’ll get a razor-sharp knife with minimal metal removed from the blade. The Chef’s Choice 15 Trizor XV is incredibly easy to use and is going to last for many years but may not be as long as you live (another 50 years). Many Chef’s Choice sharpeners have lasted for more than ten years and it’s still working. We’re sure this sharpener will last for many years to come. The price is right with the quality and years of service you’ll be getting. In our humble opinion, it’s a wise investment.